Oh my! I've been waiting for this book. No really. I've been waiting for somebody to put the words in my head together and put them into a book and for that book to be published. This is that book. I hug it. I love it. It is awesome! A friend of mine gave me a copy of this book for Christmas and I was thinking it was a lot like The Book Tree (click on title for review) and it is that. However, it is that and so much more. I would say that the differences between Read for the Heart and The Book Tree is that Clarkson shares more of her philosophy behind what she feels is good quality literature and she spreads her thoughts about by book genre. So, for example, in The Book Tree the authors give you their philosophy upfront and the rest of the book is full of suggestions for quality books to read. 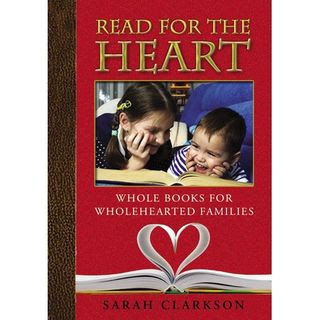 Read for the Heart is divided up into category by genre with an introduction by Clarkson to each part. She also has a more Montgomery-ish flair to her, so of course I'm going to like that. Sarah Clarkson says a lot in this book that I agreed with. We had some differences of opinion on particular book titles but you can't agree with people on everything all of the time and I'm feeling magnanimous at the moment. The very best argument that Clarkson makes in this book, and I know that this is not going to sit pretty with some of you, is against abridged classics or re-writes. It irks me when I see abridged copies of classic pieces of literature because I feel like we're doing ourselves a disservice by not making ourselves work towards deeper understanding of great works. We're such a McDonald's society - give it to us quick and easy. But where is the benefit of watering down the classics in the long run? Instead of calling ourselves to higher standards, we're trying to find the shortcut and the easy way around MASTERPIECES. It's like standing in the Louvre, looking at the Mona Lisa and deciding she's too complicated. So we grab a pencil and draw a stick figure of a lady. Er, we guess it's a lady. The stick figure has long, string-like looking hair. Must be the Mona Lisa. "AH!," we say, "I have gazed upon the Mona Lisa and she is lovely." But she's a stick figure. I'm not even going to begin describing the inner emotional turmoil I felt when I laid eyes on an abridged copy of Anne of Green Gables. My word, people!! (Don't admit it to me if you've read it.) It was written in 1908. There are no language barriers or difficulties between then and now. It's practically a children's book story. Where are our limits? "The more limited our language is, the more limited we are; the more limited the literature we give to our children, the more limited their capacity to respond, and therefore, in their turn, to create. The more our vocabulary is controlled, the less we will be able to think for ourselves. We do think in words, and the fewer words we know, the more restricted our thoughts. As our vocabulary expands, so does our power to think." When we limit our ability to articulate truth about God, we limit our awareness of His presence and power in our lives. An inadequate vocabulary sometimes equals an inadequate comprehension of spiritual reality. God formed our brains to be molded by words. The secret, which is not really a secret, according to Clarkson is to start reading early and then read often. She would argue that we should begin building within our children a love for classics and then gradually introduce the classics to them at an age where they can truly appreciate it. Developing and training child in the habit of reading is one of the greatest gifts a parent/guardian could give to a child. A child who begins reading young develops a taste for it and can tackle bigger and greater reading habits with age. Then, when the child is of an appropriate age, he or she can grab those great classics of the past and not just read them, but ENJOY them for what they are, in all of their original glory! Instead of being scared of great literature, great literature will be their natural choice. I think we adults, who are always looking for a quick fix, give children the permission that they are looking for to avoid hard things in the book department. Sure, Les Miserables (for example) is a stretch. It's long and tedious in parts. But the reward in having read it? Priceless! There is a richness in it that cannot be substituted by the Claire Danes. It is a masterpiece for a reason so why do we not train ourselves to enjoy it for what it is? Clarkson also talks about the gift of imagination in this book but I'm going to save that discussion for a separate post. There is a lot of thought-worthy information in this book and I think it offers some good and valid arguments as to why we need to be reading the best in literature to our children. By offering them the greatest writings that we can, they will learn to seek good writing all on their own. I appreciated her bringing her opinion to the table, as it is, and I feel quite comfortable in recommending this book to others. I'd be hard pressed not to! I don't think classics should be abridge either. I think kids should discipline themselves to learn to read longer books. AMEN!!! I am adding this book to my Amazon wishlist! I homeschool my kids and they read the classics. Unabridged. I think with something like Les Miserables, which is well-known for its extensive rabbit trails, I'd rather someone read an abridged version than not at all. But Anne of Green Gables? That is very easily understood in its original form. I agree, I do think we need to expand our (and our children's) vocabulary and horizons and understanding rather than chop everything into "fast food" for them. I know Les Mis has rabbit trails. And I skimmed them myself! I didn't really care about the sewer systems in Paris. That said, I still think we shouldn't ABRIDGE the book but leave it as it. Those that want to read it can and those that don't can skim. Did you find suggested titles in this book that you hadn't come across before? I have so many books and articles that recommend reading lists for children that I'm never at a loss for what to read to my kids. Is this book much more than that so it would still be worth reading? Wiggins - Actually, I think her list is smaller than that in The Book Tree. The defining point of this book is that she divides the book by genre instead of age and argues her points as to her selection well. There's more...hmmm...philosophy behind it. I agree that I would probably never be at a loss to find something for my kids to read and admittedly I consult no lists! Mostly, I appreciated hearing the "why" arguments behind her lists. Hopefully this helps. For myself, I really am glad to have this book on hand for argument sake. For you, you might prefer to just skip or skim. Someone wrote an abridged version to Anne of Green Gables??? Seriously? I started reading that book around age 7. I've also read it as an adult. There is no reason to write an abridged version of that book!! I read your blog today!! Now it's bookmarked on my toolbar so I can read it every day :) Thanks for the suggestions and reviews, Carrie! Are you familiar with 'Honey For a Child's Heart' by Gladys Hunt? How would these books compare? I haven't read Honey for a Child's Heart so unfortunately I cannot compare. I have Honey for a Child's Heart and have looked through it, but I haven't thoroughly read it. However, it does have extensive book lists. I'd say a little over half the book is devoted to lists, and they are divided by age group. One more thing, while I'm "arguing" ;-) . One of the concepts/tenets/arguments behind much of the classical education stuff I've read (and I've read a good bit) is that we SHOULD introduce our young children to abridged versions of the classics, so that when they're old enough to read the "real thing," they'll be comfortable with the story and not scared off by it. Hmmmm. Interesting. Much food for thought. I want to read Read for the Heart myself, and I've only recently paid attention to Clarkson at all, so I suspect I'll be adding several of her titles to my TBR list! Amy - yes, and I hear the argument and have always rather sympathized with it to a degree. Perhaps I should say that I've always felt like it was the best argument for abridged works. However, I really, really, really like the point that Sarah makes that we feed our children age/stage of life appropriate classics. So you would build up. When we think about it, the complaint is that we didn't appreciate the classics we read in high school, right? Maybe that's because we were rushed into works that we would have had a better appreciation for a bit older. Something else for high school and then when we're reading adults, we'll reach for things that are more suitable. And I wasn't picking on you. =D I picked a random title! Over the years I've collected half a dozen books on "classics everyone should read", but these are two new titles to me. Thanks for pointing them out. Googled the book, found your review. Thanks for providing it! Love when I find a blogger I trust to share opinions on something I'm actually interested in!